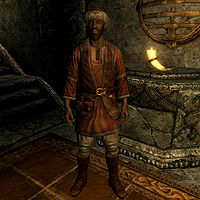 Endon is a Redguard citizen who is usually in the Silver-Blood Inn in Markarth. He is the husband of the merchant Kerah and the father of Adara. He is often seen in the company of his daughter perhaps hinting that the two are close. Conversations between Endon and his family indicate that he also has a son, Cade, who has left Markarth to join up with the Stormcloaks. Prior to completing Silver Lining, his house is locked and he wanders the streets of Markarth when he is not in the inn. After the quest is complete, he becomes a fence and can be found either in his home or wandering randomly around town (most often either in the plaza in front of the inn or on the stone bridge overlooking it). Endon does not feel that his family is safe in Markarth and the attack in the marketplace only confirms his fears. After the attack he can be heard arguing with his wife Kerah. She wishes to stay in the city but Endon feels that it isn't safe and wants them to move elsewhere. However, any plans Endon might have to move his family out of Markarth are never acted upon and he can always be found within the city walls. Endon wears a set of merchant's clothes along with a hat and a pair of boots. He carries the key to his house, Kerah's key, and a selection of upper-class items and gold. In combat, he relies on an iron dagger. Being proud of his work as a silversmith, Endon will greet you with the following statement: "I work silver, like my father, and his father before him." He might also mention both his wife and daughter in greetings, "My wife Kerah runs our jewelry stall in the market. ", "My daughter Adara is also my apprentice. She's a quick study." Afterwards, he changes the subject back to his work, "I prefer working in silver. More skill needed than forging iron or steel." Kerah: "What am I supposed to do? Never leave the house? You want that, Endon?" Endon: "You're closing the stall, and that's final." Kerah: "You want to give up now? Out of fear? Is that what we're teaching our daughter?" Adara: "Mama, why are you and papa fighting?" Endon: "We're not fighting we're just.... Why don't I get you something to eat? Mama and papa will talk later." When you are ready to perform the special assignment for the Thieves Guild in Markarth, Delvin Mallory will brief you on the details: "I want you to head out to Markarth and speak to Endon. He's a silversmith... has some kind of a shop there. His father was a good friend of the Guild back in the day, and we could really use his family's influence back on our side." With this information, you can go and speak to Endon, who will be relieved to see you: "Oh thank goodness! I wasn't sure where else to turn..." From there on, he will continue and give you the full story, "Several months ago I ordered a special silver mold from some artisans in Valenwood by way of a Khajiit Caravan. Well, it never arrived. Later I found out that it was robbed by a group of bandits led by someone named Rigel Strong-Arm." Asking him why he would need the Guild to help with that will have him say "Look, I talked to the Jarl, the Steward, the Housecarl... everyone. They all told me their resources were spread too thin right now. Word on the street says that the Thieves Guild is coming back into its own in Markarth so I figured..." Saying that it is a good idea to have a thief steal something back that was stolen will have him say "Exactly. Look, this mold is irreplaceable. I'll pay you well for its return and I can also prove to be quite a valuable ally to the Thieves Guild." If you reply by saying that there is no time to lose, then Endon will give you the last remaining info on the bandits: "Yes, indeed. The only thing I can tell you is that the mold was taken to the bandit's hideout... a small cottage called Pinewatch. I'm not sure how many men they have inside, but I trust that won't be an issue for you. Good luck." When ending conversation, Endon might either say "I have silver to bend." or a simple "Farewell." When you either return from Pinewatch with the mold or already have it in your inventory when receiving the quest, Endon will be very content with you and the Guild: "You've more than proven that the Thieves Guild is back on its feet in our city and earned every bit of your reward. Tell Delvin that he can count on me to provide the influence around here with the right people when he needs it. If you're ever looking to sell any illegally obtained merchandise, I'd also provide my services as a fence. It's the least I can do." Endon, now serving as a fence, will be more than happy to conduct business with you. You can ask him how business is going and he will happily reply: "Business is absolutely booming, my friend. I've taken to hiring a few extra men of my own just to keep up with all the shipments. Old Delvin certainly takes care of his own, doesn't he." As fence, he will also receive some new business-related greetings: "Glad your [sic] here, I've been looking for some more merchandise to buy. Have lots of orders to fill and my clients don't like to wait. ", "Now I know you've come by for more than just a visit. What did you bring? ", "I promise you, I buy much more than simple silver trinkets. ", "I've made a lot of new contacts thanks to you, and more contacts means more coin for everyone." After fencing some goods, he will end the conversation by saying "When you get back to Riften, tell Delvin this new arrangement's working out quite well." If you, however, manage to break one of the Guild rules, Endon will refuse to deal with you: "I've been forbidden to deal with you until amends are made with the Guild. Sorry." This is the merchandise found in Endon's Merchant Chest, once Endon becomes a Fence. These items are only available if purchased from the merchant; they cannot be pickpocketed or stolen. They are restocked every two days. Kerah: "Hello, dear husband. Have you brought more silver jewelry for me to sell?" Endon: "Yes, I have. Adara made the rings herself. She is learning to bend the metal well." Kerah: "They are perfect. Thank you both." Endon: "How are the necklaces selling, my wife? We could make more." Kerah: "I'm afraid the necklaces aren't selling well. Customers are not interested in medallions engraved with the symbols of other provinces." Endon: "Humph. Used to be everyone in Markarth wore a necklace showing his home province, from Elsweyr to High Rock to Hammerfell and Cyrodiil..."
Kerah: "We don't have travelers from Elsweyr or Hammerfell anymore, Endon. Only the natives and the Nords stay in Markarth now." Endon: "As they always have, along with those crazed Forsworn. They've driven off the color that used to make this city great." Kerah: "I need to get back to the customers. We'll talk more of this when I come home tonight." Endon: "Markarth has changed, but the inn is as lively as ever." Kerah: "The city hasn't changed that much, dear. Some old dwarven stones gathering the same old moss." Endon: "The stones aren't what bother me, love. The Forsworn are tearing the Reach apart." Kerah: "Let's not talk about this over dinner." This page was last modified on 18 August 2018, at 21:21.